Hearty risotto dishes are a great way to warm up during those cold winter days and can be prepared in so many variations from the traditional risotto recipe. 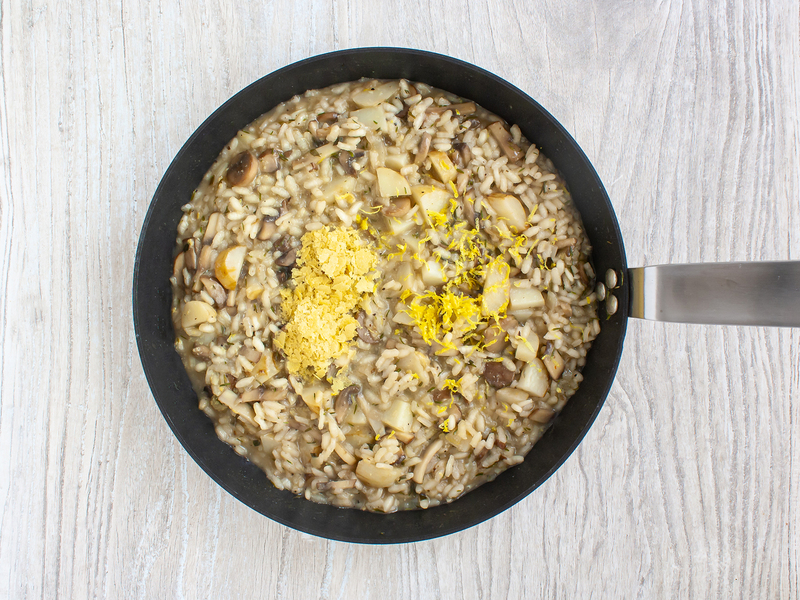 This easy gluten-free and vegetarian risotto is made with Jerusalem artichokes and mushrooms sauteed with fragrant garlic, thyme, and chives. Crunchy walnuts pieces and low-fat crumbled feta add a perfect finish to this main dish. Jerusalem artichokes are a versatile ingredient in many recipes and you can use them as a substitute to potatoes while adding extra flavour. 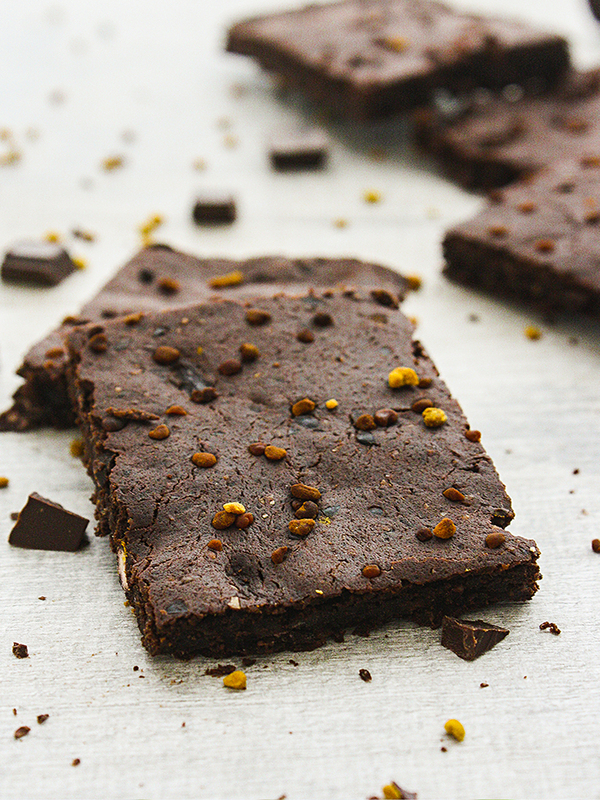 They are also a great source of fibres and iron, providing 20% of iron in 100g. 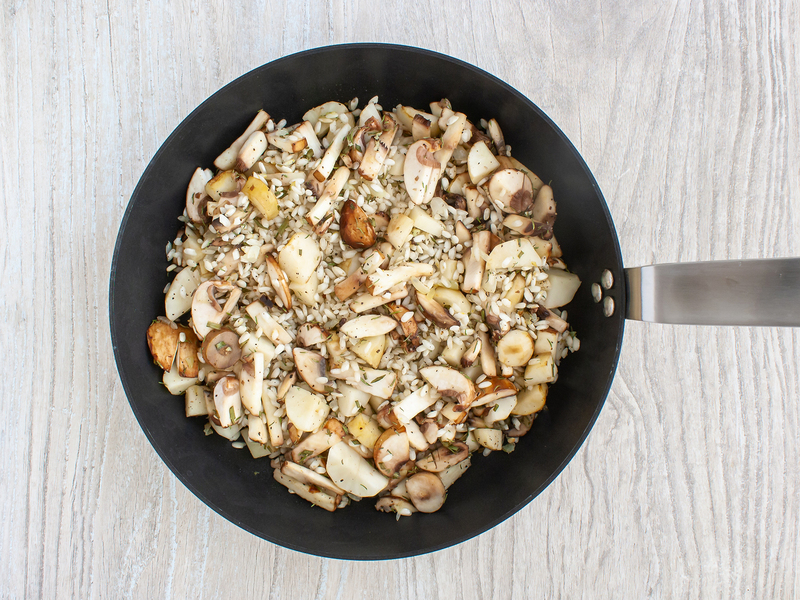 This mushroom risotto is prepared without wine and we have replaced parmesan with the super healthy nutritional yeast to reduce calories and increase the intake of B group vitamins. 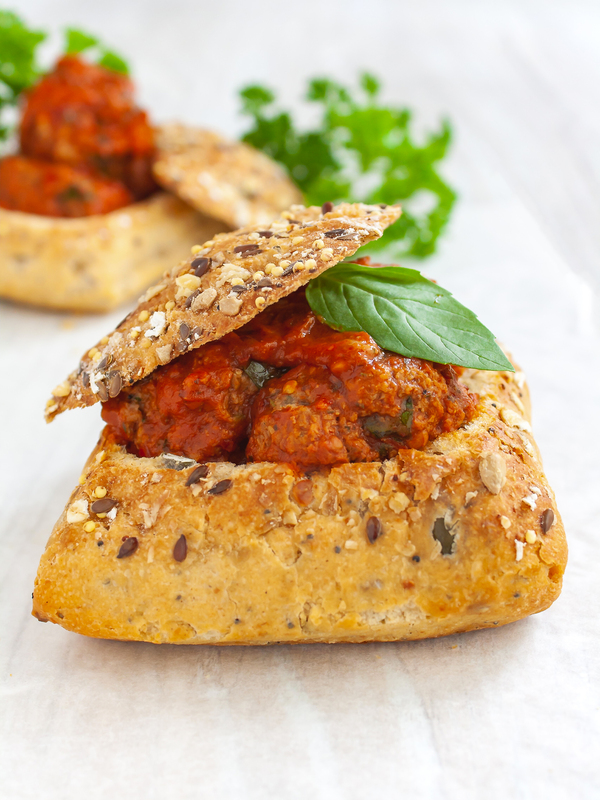 The addition of feta also boosts the protein content of this dish for a fully balanced meal. In fact, this healthy risotto is high in fibres and proteins and low in saturated fats, with 500 calories per serving. 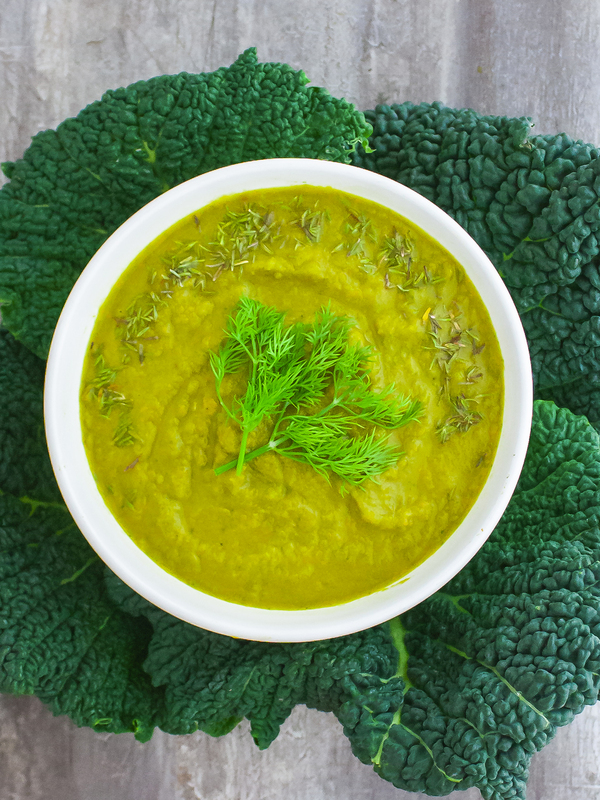 If you want to discover more about its nutritional properties, just click on the nutrition tab above. 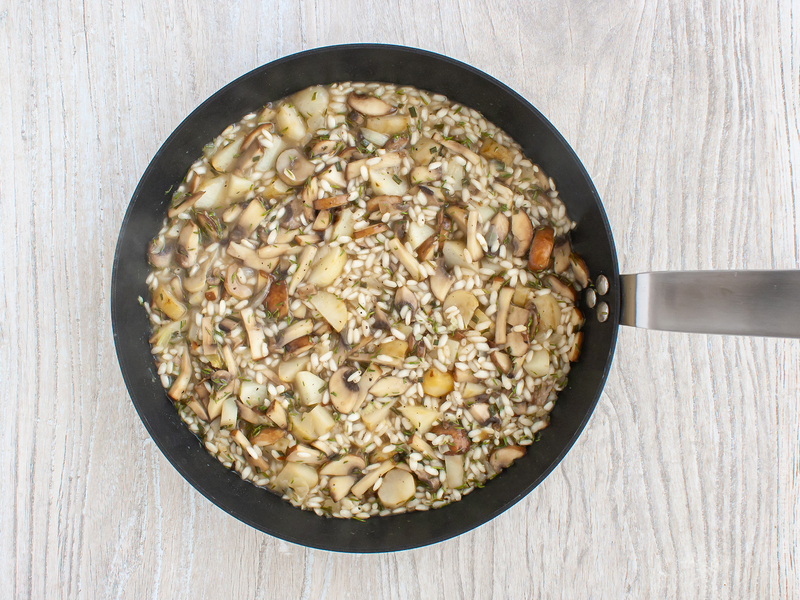 To prepare this easy mushroom risotto recipe, pour the vegetable stock in a pan and bring to the boil. Keep it simmering at low heat throughout the recipe as you&apos;ll need it to cook the rice. 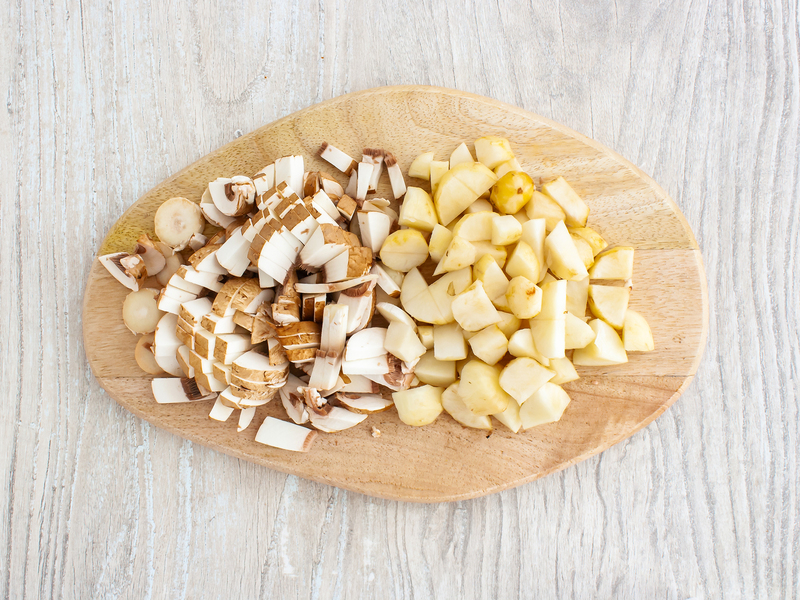 Meanwhile, peel and chop the Jerusalem artichokes and slice the mushrooms. 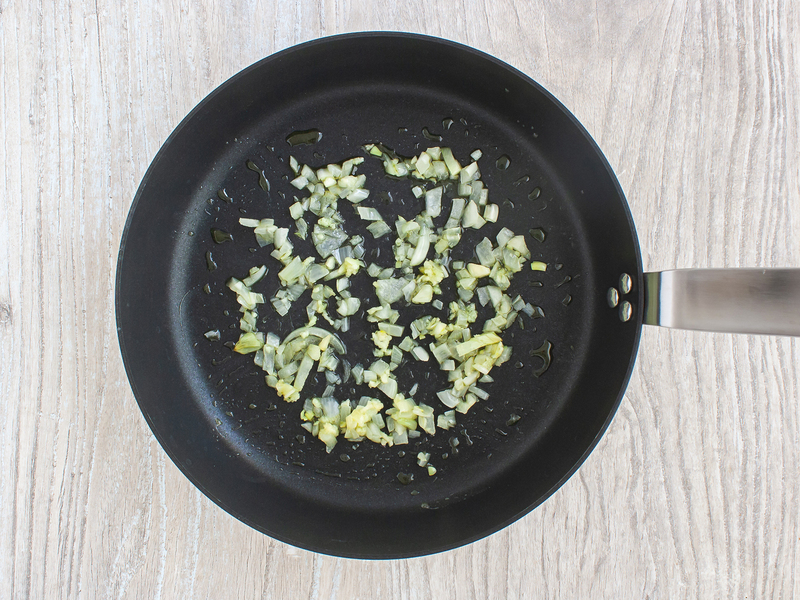 In a large saucepan sizzle thinly chopped onion with olive oil until it turns translucent. Crush the garlic with a garlic crusher and fry until lightly golden (1). 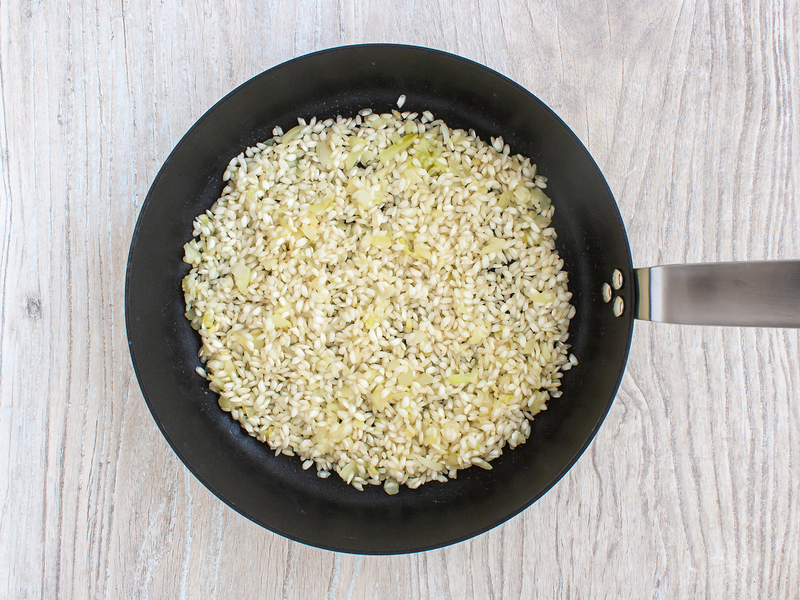 Stir in the arborio rice and toast for 3 to 5 minutes on medium heat (2). Stir in the Jerusalem artichokes and mushrooms and season with thyme, chives, black pepper and salt (1). Pour enough stock to cover the rice and vegetables, simmer until reduced and then add the stock again. Repeat this step until the rice is cooked through and you have a creamy risotto (2). Add nutritional yeast and grated the lemon zest and stir well (1). 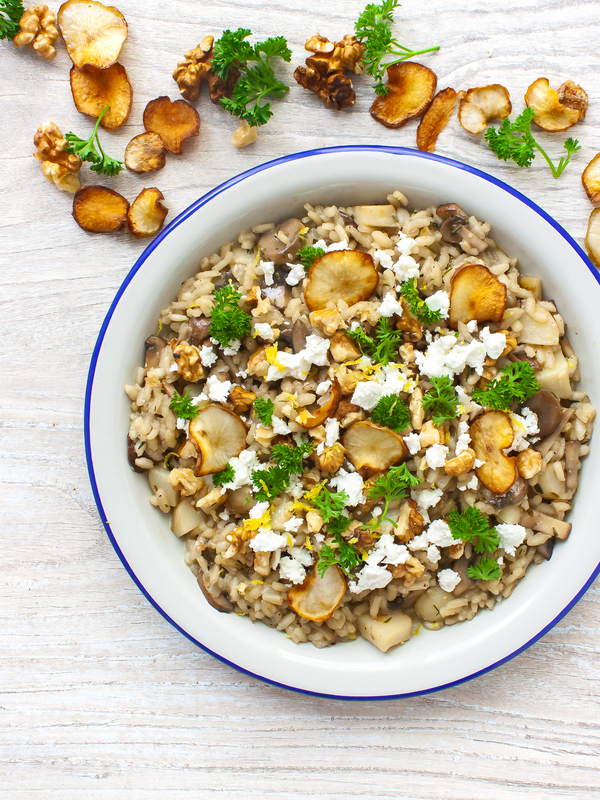 Prepare a bowl for each serving and spoon in the Jerusalem artichoke and mushroom risotto. 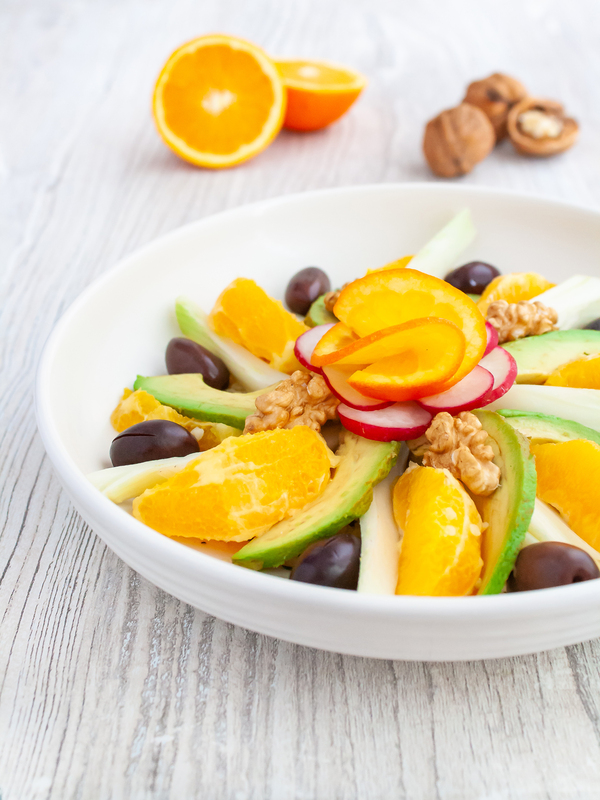 Sprinkle with walnuts pieces and feta crumbles and garnish with fresh parsley (2). Enjoy your delicious vegetarian mushroom risotto dish! For extra flavour, pour a bit of white wine in the rice before adding the vegetables and allow to evaporate. You can use parmesan shavings instead of nutritional yeast for a traditional mushroom risotto. 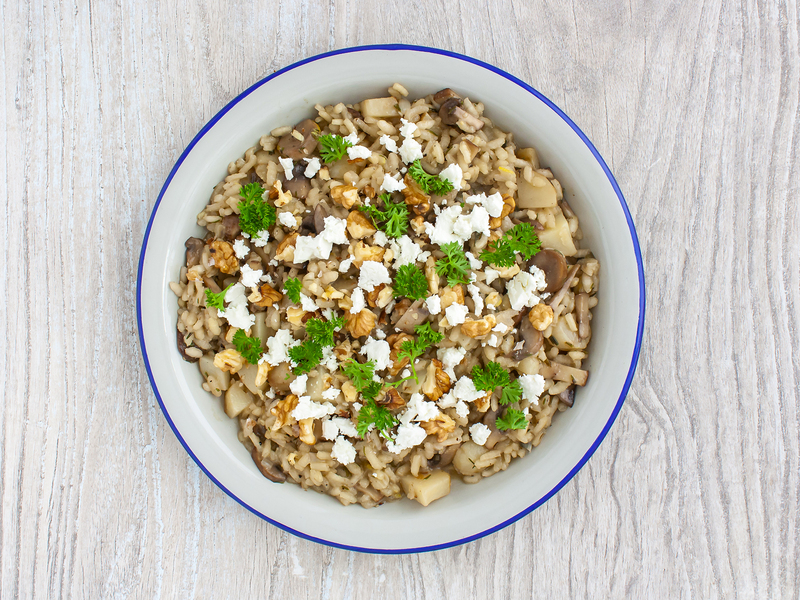 You can replace feta with diced tofu or soy-based cheese and still get an indulgent vegan risotto recipe.